Copyright © 2017 finediningindian.com , All rights Reserved. wanted to become a room service manager got attracted to the suit. my mother’s death made me a serious person and winning the 2nd place in Chef competition in my IHMCT & AN by her blessings . motivated by the cuisine of Singapore, never giving up attitude and just do it what u believe in. what should be Indian chefs approach in making Indian cuisine best in The World? Make it more eye appealing, more refine, use high-end ingredients, never compromise with the quality of ingredients, French like presentation, Make it Indian but should not look like Indian. what you want to be known for and what legacy you want to leave behind? Known to be humble Chef Who tried to promote Indian Cuisine in Asia and in world, And a passionate Chef who loved his cuisine and shared his knowledge with younger chefs and so that its journey of promoting Indian cuisine in carry on. What makes you proud of all your achievement? A good team leader and the team which is behind my success and I am proud of My Team for all the achievements. one of your worst food critic or comment you? Touch wood no worst even once. But got complaints; about few times related to taste. Being an Indian Head chef, what difference it made in your life. Challenges in retaining good reviews? I have learned a lesson all these years. It’s not possible to make every guest happy, but passion does not allow me to keep quiet, so we try as much possible make everyone happy if not very happy accept the bad reviews, but I work hard to make other guests happy, and let’s be positive and carry on. what was your exposure and training in modernist cuisine? Since I am in Asia, for last 11 years, my food is becoming modern in a way with an influence of Asian twist, taste and presentation. How you conceive a dish, improvise traditional dish in international style? Presentation, using the international elements, trends present, customise according to local the taste and overall experience of the meal. How you train your team with an international mix? I put Trainee in the all departments, make him learn sop and standard operating recipes, then get him to work on quality, consistency and presentation. And make an expert in set menu preparation. Three daily rituals you do as a chef and why it’s important? Briefing Being on the counter & tasting the food Talking to my team in a personal way checking everything is ok. Trying to meet guest as much as possible. If you would have given a chance to pick the dream team with Famous Indian chef whom you pick? Include yourself in any position to run a kitchen for a day. How you keep up to date, which web sites or books you refer when compiling new menu and your approach to designing a menu? I believe in my ideas and India is a vast country every region inspires me to take a modern dish, e.g., I made Srikhand Mango molecular Bubble with mini puri, Tamarind Froth Pani puri, I like to original. I believe no other cuisine can beat the taste of Indian cuisine.it’s delicious. what guidance do you like to provide for Indian chefs; to follow a successful career like yours? Believe in your self what you doing, set a principle what kind of cuisine you want to introduce, Make Indian food healthy with out compromising taste and work on presentation make more eye appealing it does not look like an Indian dish, Make interesting set menus. Create some interesting Chef oriented drinks. pick one dish that represents you and why it’s your favourite, thought behind its creation? 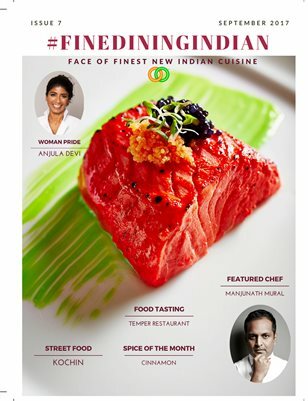 Sambhal Infused Norwegian Tandoori Salmon With Masala Caviar It defines my style of cuisine Asian influence but cooking with the tradition while adding a little bit twist Asian spice elements. We strive to achieve this by providing a platform for all Indian food lovers around the globe. Copyright © 2017 finediningindian.com, All rights Reserved.